The line for the One GW launch, held Sept. 15, stretched far beyond the gates of the Eye Street Mall. Nearly 4,000 employees - faculty, staff, residents, and students from the GW School of Medicine and Health Sciences (SMHS), GW Hospital, and the GW Medical Faculty Associates (MFA) - passed through the mall, loading plates with Sodexo-catered jerk pork with ginger glazed pineapple and fresh corn on the cob, before taking pictures with GW mascot George Washington and posing for photo strips. "We're delighted with the turnout today," said Jeffrey S. Akman, M.D. '81, RESD '85, vice president for health affairs, Walter A. Bloedorn Professor of Administrative Medicine, and dean of SMHS. "One GW brings together the three medical entities - SMHS, GW Hospital, and the MFA - under one umbrella, and this closer alignment will allow us to better join our efforts and resources. A stronger GW brand benefits all of us, and it's this kind of community event that embodies One GW." SMHS, GW Hospital, and the MFA have traditionally maintained a collaborative relationship, particularly with conducting groundbreaking research and educating health care professionals, but the new alignment creates a greater structure, with three primary goals: to offer patients the most comprehensive and highest quality of care possible; to train the next generation of medical professionals through technically advanced clinical techniques and modalities; and to improve patient outcomes by advancing biomedical, translational, and health services delivery research. 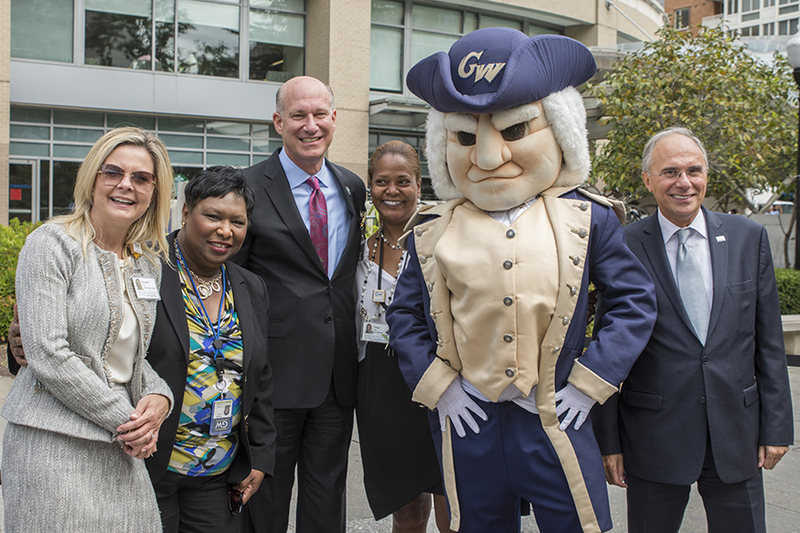 "As an academic medical center, GW Hospital is committed to providing the highest quality care in an environment dedicated to education and research," said Kimberly Russo, M.S., M.B.A., CEO and managing director of GW Hospital. "Our academic and medical partners play a substantial role in helping us meet that mission. This event reflects the impact that we can have when we unite to provide excellent care to the D.C. community. " One GW also empowers physicians to participate in a shared governance model, which "provides them with a more active role in decision-making and planning for future success," said Anton Sidawy, M.D., M.P.H. '99, Lewis B. Saltz Chair and Professor of Surgery at SMHS and president of the MFA. "What we're doing will not only enhance the rich partnership of the MFA, GW Hospital, and SMHS, but it will also allow us to better serve our patients and our community."